In 2+2 Talks, India Says It Expects "Non-Discriminatory Approach On H-1B"
External Affairs Minister Sushma Swaraj expressed satisfaction over the agenda of the inaugural dialogue while giving the details of the deliberations. US and India have signed a path-breaking agreement COMCASA on Thursday. A long-negotiated defence pact under which critical and encrypted defence technologies will be provided to the Indian military by the US was inked on Thursday in New Delhi after the two countries held their first 2+2 dialogue. They also discussed key issues, including cross-border terrorism, India's NSG bid and the contentious H1B visa issue. During the talks External Affairs Minister Sushma Swaraj and Defence Minister Nirmala Sitharaman had with US Secretary of State Mike Pompeo and Defence Secretary James Mattis, the two countries also decided to set up hotlines between them. Addressing a joint press conference, Sushma Swaraj expressed satisfaction over the agenda of the inaugural dialogue while giving the details of the deliberations. While Mike Pompeo termed the 'Communications, Compatibility, Security Agreement (COMCASA)' agreement a "milestone" in the relationship, Nirmala Sitharaman asserted that the pact will enhance India's defence capability and preparedness. It will also allow the installation of high-security US communication equipment on defence platforms being sourced from the US. Ms Swaraj also asserted that the dialogue reflected the desire of leadership of the two countries to further elevate the bilateral strategic communication on cross-cutting defence and security issues. She said, "The recent decision by the US to put India in the list of countries eligible for Strategic Trade Authorization Tier-I License Exemption reflects India's robust and responsible export control policies. In our meeting today, we also agreed to work together to secure India's membership of the Nuclear Suppliers Group at the earliest." Talking about her bilateral meeting with Mike Pompeo before the 2+2 dialogue, the External Affairs Minister said they reviewed the direction of the Indo-US relations in recent months and exchanged views on a number of regional issues of shared concern. Terming the rapidly growing trade and investment ties as an important element of bilateral relationship, Ms Swaraj said this growth is giving rise to new opportunities and a basis for more intense economic engagement which supports development of manufacturing, promotes knowledge and innovation, creates jobs and provides critical resources for growth. "I sought Secretary Pompeo's support to nurture our people-to-people links. Specifically, I conveyed our expectation for a non-discriminatory and predictable approach to the H1B visa regime, given its high impact on innovation, competitiveness and people-to-people partnership, all of which are a vital source of strength for our relationship," Ms Swaraj said. She also noted that there was a growing convergence of views, including on the Indo-Pacific, during the discussion among the four ministers. "We see the Indo-Pacific as a free, open and inclusive concept, with ASEAN centrality at the core and defined by a common rules-based order that both our countries are pursuing," the minister said, adding India welcomed the US' interest in expanding its economic footprint in the region as they "complement our own efforts". 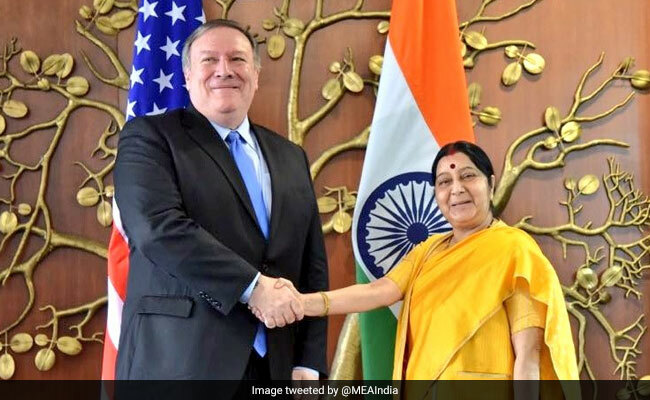 Asserting that counterterrorism cooperation between India and the US has acquired a new qualitative edge and purpose, Ms Swaraj said they have agreed to deepen ties in international forums like the United Nations and the Financial Action Task Force. "We welcomed the recent designations of Lashkar-e-Taiba terrorists by the US. They underscore the international community's scrutiny over the threat of terrorism emanating from Pakistan, which has affected India and the US alike. On the 10th anniversary of the 26/11 attacks, we recognized the importance of justice and retribution for the masterminds behind this terrorist attack," Ms Swaraj said. She also said, "India supports President Trump's South Asia Policy. His call for Pakistan to stop its policy of supporting cross-border terrorism finds resonance with us". The two sides also discussed the ongoing efforts by India and the US in promoting an Afghan-led, Afghan-owned and Afghan government-controlled reconciliation process, that brings together all ethnic groups and political formation in that country, the minister added.